The following represents a sample of some of the interesting projects in which Burke Design has been involved in recent years. Please check back often- this page is updated as new projects are added to our growing list of accomplishments. Some of our work, particularly in the energy, industrial and transportation sectors, is governed by intellectual property and nondisclosure agreements (NDA's), and therefore cannot be shown below. Projects in these categories include composite wind and hydro power turbines, theme park monorails, etc. If you would like further information on the work that we have done, please contact us. Burke Design has consulted for several composite superyacht owners in recent years, often when their vessels were either under construction or newly delivered. When various structural or performance problems were encountered, we traveled overseas to perform inspections and/or sea trials, and worked with the owners and shipyards to successfully resolve the issues. We are pleased to provide worldwide consultation services for these large and complex vessels. Burke Design is proud to play an important role on the MJM Yachts development team. Since the inception of the brand, we have worked with MJM, Zurn Yacht Design, and Boston Boatworks for the design, engineering and construction of all of their models, including the 29z, 34z, 35z (new outboard model), 36z, 40z, 43z (new outboard model), 50z (shown), and 53z (new outboard model). These high quality, fast, comfortable vessels have in common their strong, lightweight, high-tech composite construction, resulting in high performance and excellent fuel efficiency. Burke Design engineers their composite structures to exceed ISO design category A, "ocean," and coordinates their CE certification for worldwide marketability. 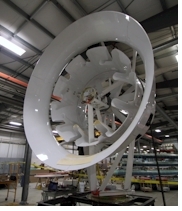 Burke Design worked on the engineering team for an advanced, shrouded 6 kW wind turbine prototype. This was our third assignment for this respected, innovative company. We are pleased to have worked with our colleagues at turbomachinery experts Turbo Solutions Engineering, with whom we have partnered on several energy-related development projects. Burke Design specified the materials, designed and engineered the structures, and assisted with production of the fabrication drawings for the composite wind turbine components. The carbon fiber and fiberglass components were built, and the turbine assembled by industrial composite manufacturer Kenway Corp. of Augusta, ME. We engineered a 40' long x 12' high x 10' wide composite tank for Kentucky-based, advanced environmental treatment equipment manufacturer Purestream ES. Burke Design performed the structural calculations, specified the materials, and provided the production drawings for the fiberglass, foam-cored, corrosion-resistant wastewater treatment tank. The first of these tanks was planned to be installed in 2011 on Long Island, New York. 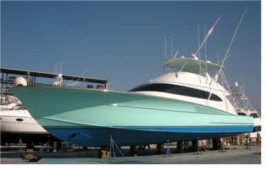 Burke Design performed the engineering for a series of composite parts installed on Sycara IV, a 151 ft. classic fantail cruiser. This elegant custom yacht was launched in 2009 by Burger Boat Company of Manitowoc, Wisconsin. The carbon/epoxy parts were expertly fabricated and assembled by Custom Composite Technologies of Bath, Maine. We performed the structural calculations and provided detailed construction and assembly drawings for the removable mast, equipment platforms, and funnel. We provided consulting engineering services to the Hinckley Company for the first fixed-keel model (Mark II) DS42. This world-class daysailer/weekender combines space-age technology with traditional styling and workmanship. Construction was completed in the summer of 2007 at the Hinckley yard in Southwest Harbor, Maine. Burke Design performed the structural calculations in accordance with ABS (American Bureau of Shipping) standards, and provided engineering drawings and production support during the lamination of the resin-infused Kevlar/carbon/vinylester hull and E-glass/vinylester deck, the fabrication of the keel, and the assembly of the yacht's components. Cirque du Soleil contracted Burke Design to design and engineer prototype composite freestanding acrobatic poles, for evaluation and potential later use in their award-winning shows. We engineered the poles to be fabricated from carbon/epoxy unidirectional prepreg fabric wound around a tooling mandrel, to produce tubes designed to fit into sockets located in the stage floor. Structural calculations were performed to ensure that the poles would perform within the design (deflection and strength) requirements. Detailed construction drawings were issued to specify the pole laminates and manufacturing instructions. 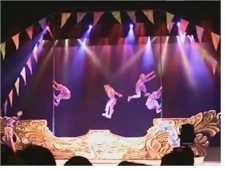 Following their evaluation by Cirque du Soleil's artists, the prototype poles may be further refined prior to their production and incorporation into the spectacular stage performances. The TKTS Times Square theater center offers same-day discount tickets for Broadway, off-Broadway, dance and music events. One of New York's most visited attractions, it has been operated by the Theater Development Fund since 1973. A competition to update the site attracted hundreds of entries from over 30 countries. The winning design features a large composite shell housing 12 ticket windows and attendant facilities, topped by a lighted glass stairway affording a spectacular view of its surroundings. Burke Design engineered the composite shell and provided the construction drawings to fabricator Merrifield-Roberts. We are proud to be associated with this major NYC landmark. The center reopened to the public in October 2008. Fiberglass enclosure manufacturer Carolina Cockpit Inc., under contract to National Oilwell Varco, retained Burke Design to perform the composite engineering for a series of crane operator cabins. 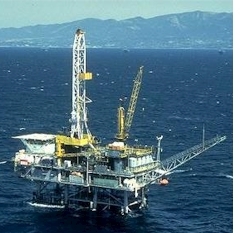 The completed units were installed on offshore oil rigs located off the coast of Brazil and operated by Petrobras, the Brazilian national oil company. Burke Design specified the composite laminates, and submitted the structural calculations for the cabins and their foundation attachments, for approval by regulatory authority DNV (Det Norske Veritas). The crane operator cabins were designed to survive severe storm conditions and the accelerations induced by the accompanying sea state. 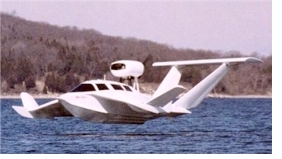 Burke Design provided a wide range of composite engineering services during 2003-2004 for the Sea Jet 51 and Sea Flite 61 flying boat development programs. We worked closely with noted aircraft designer Daivd Thurston, of Thurston Aeromarine Corp., and builder Meikle Marine and Machine, Inc., of Tiverton, RI, to perform the structural analyses and develop the structural arrangements and composite laminate schedules for these innovative, all-carbon/epoxy craft. Burke Design produced full-scale CAD drawings to drive the builder's CNC router and to assist with the manufacture of tooling and parts. We provided extensive on-site engineering and technical support during the new prototype production, assembly and flight test phases of the program. Built for a New York investor, a fully optimized, enlarged version of the craft was to be FAA and USCG certified, and produced in series to provide water taxi service between islands in the Caribbean Sea. Telecommunications companies, as an alternative to buying land and building more of the cellphone towers that increasingly dot our landscape, are beginning to install their equipment in existing structures and buildings with favorable locations. 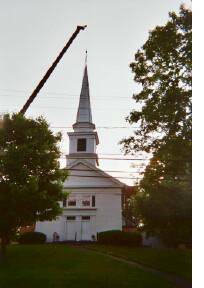 Industry giant Sprint PCS sought to replace the existing wooden steeple of the United Methodist Church in Gaylordsville, CT with a larger RF transparent fiberglass steeple. They contracted Symmetry Products Group of Lincoln, RI, an experienced industrial fiberglass fabricator, to build the new composite spire. Burke Design designed the composite structure of the 41ï¿½ spire in accordance with national (BOCA) and state building codes, to withstand equipment and live loads, hurricane force winds, and seismic events. We supplied the spire construction drawings to the builder, including the composite laminate schedules, interior work platforms attachments and supports, hardware attachment instructions, and component bonding specifications. Burke Design then inspected the fabrication of the spire, on behalf of Sprint. We performed five shop fabrication inspections, covering the manufacturing of the patterns and molds, the composite lamination process, component bonding operations, and a final inspection. Detailed reports were written and issued for each of the inspections. The composite spire was erected on the church and went into service in May 2003. Burke Design was hired by industrial fabricator Symmetry Products Group of Lincoln, RI to provide engineering support for the "Sergeant Jasper" RF Stealth Enclosures project. Three separate enclosures, each of unique design, were built for Cingular Wireless to house cellphone and GPS equipment atop a high-rise apartment building in Charleston, SC. Burke Design performed a complete set of structural calculations for the enclosures. They covered wind-induced panel deflections, as well as all construction details including the strength of panel connections, glue joints, welds, fasteners and braces. 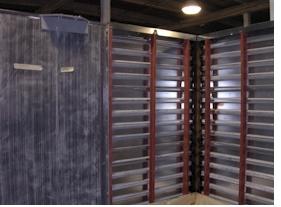 Designed to survive through hurricane conditions, the enclosures' cost-effective design incorporates composite panels in areas through which RF signals pass, and steel construction in the non-RF transmission areas. Burke Design was also contracted to provide production supervision in the fabricator's shop during final assembly of the units, whch were completed, shipped and installed in early 2004. Burke Design performed a composite laminate study of the XP-300 25m waterjet-powered catamaran ferry for builder TPI Composites. The 2001 study of the existing composite hulls, bulkheads, girders and associated structure was aimed at reducing component manufactured weights and costs, while ensuring full compliance with regulatory authority Det Norske Veritas (DNV) structural requirements. The laminate study structural calculations and weight estimate successfully identified several key opportunities for significant weight savings. Our recommended laminate modifications resulted in a total weight reduction of over 15% for the E-glass/balsa/vinylester resin-infused structure. Construction material and labor costs were substantially reduced, and vessel performance increased accordingly, allowing operation at design speed with significant fuel savings. Burke Design engineers and supervises structural repairs and modifications of all types. Whether your project is large or small, we can help! We provide engineering, detailed step-by-step work procedures, drawings, material selection, and onsite inspections for repairs resulting from collision, grounding, storm damage, fatigue, fire/heat, environmental effects, and other incidents. Burke Design also routinely specifies the required structural reinforcements for adding any kind of specialized hardware. We work closely with you, your yard, shop or insurance company to ensure consistently excellent results. Across town or around the world, Burke Design is ready to assist you with your special requirements! Burke Design conducts numerous insurance and legal investigations of the causes of composite structural damage on a wide variety of vessels, ranging in size from small boats to superyachts. In each case, we travel to carefully inspect the subject yacht or commercial vessel, and recommend/analyze appropriate nondestructive testing. Representative laminate samples are removed as necessary. We often work with respected test laboratories in order to accurately determine the cause of the failures. Our repeated success with this type of work has led to Burke Design becoming a primary resource for these often-challenging investigations. Burke Design designs and engineers structural foundations for Seakeeper gyro stabilizers, for both new construction and retrofit installations. These advanced gyro stabilizers significantly reduce rolling motion for all types of vessels at zero-speed and while underway, eliminating the need for external appendages. Burke Design was invited to attend a product orientation meeting at the Seakeeper production facility in 2010. We have since designed custom gyro foundations, in both composite and aluminum, single and twin installations, for many vessels including the 72-foot sportfisherman shown. 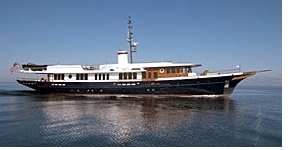 We inspected the Cheoy Lee 88-ft. motor yacht Viaggio in Savannah, GA, in 2007. The yacht had been damaged in a storm off Cape Fear, NC, just six months after her delivery. A large wave had come over the bow, with the impact separating the deck, or 'eyebrow' above the bridge, from the deckhouse structure beneath it. Seawater flooded the interior, causing extensive damage to the vessel and her systems. Burke Design documented the nature and extent of the damage, participated in the selection of laminate samples for laboratory analysis, and identified the cause of the failure. Our client, High Modulus New Zealand, were the structural engineers during the original design and construction of the vessel. The Hinckley Company called Burke Design to assist with the design and engineering of structural reinforcements for Kathryne Grace, a Little Harbor 73 built in Taiwan in 1981. We inspected the yacht at the famed Hinckley yard in Southwest Harbor, Maine, prior to her undergoing an extensive refit during the winter/spring of 2007. Recommended structural work included the installation of a new midships ring frame and bulkheads to improve support for the hull, as well as the replacement of some existing components and bracketry. A new belowdecks tierod and hull girder were engineered to anchor the inner forestay. The refit included the installation of new machinery, and significant upgrades to many of the mechanical and electrical systems. SailNassau operates two International America's Cup Class (IACC) yachts from their base on Paradise Island, Bahamas, adjacent to the Atlantis Resort. They offer the excitement of America's Cup-style match racing to their passengers, who are encouraged to participate in crewing the yachts during the races. 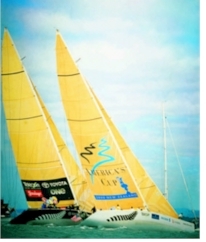 NZL10 and NZL12 were originally built for Team New Zealand for the 1992 America's Cup competition. 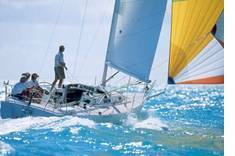 Each yacht is currently licensed to carry up to 25 passengers, plus the SailNassau crew. Passengers typically consist of hotel guests, cruise ship passengers, and corporate charter groups. In the summer of 2006, Burke Design received an urgent call from SailNassau following the failure of the starboard belowdeck chainplate support structure on NZL10. This caused the structure to come up through the deck, resulting in the loss of rig tension, and the subsequent breaking of the 115-foot tall mast in two places. Fortunately, no one was injured during the incident. 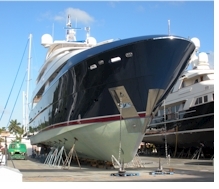 Burke Design immediately traveled to the Bahamas to inspect the yachts, finding that their existing chainplate structures had been significantly modified over the years. After careful consideration, we decided that the best course of action would be to design and install new chainplates. SailNassau requested that they be made of composite materials, with the pins above the deck to facilitate inspection. Upon our return to the office, we issued an Inspection Report and Repair/Reinforcement Procedure, along with four supplemental CAD drawings. These documents detailed the inspection results, the repair of NZL10's deck, and the fabrication and installation of new chainplate structures for both boats. Also addressed was the required reinforcement of several ring frames, as well as reinforcement of the hull in the vicinity of the lower rudder bearing on both vessels. The new chainplate panels were designed and built with carbon/epoxy unidirectional prepreg, placed through the deck, bonded and laminated into new carbon/foam/epoxy transverse brackets, with new longitudinal brackets of similar construction. This configuration was engineered to exceed the strength of the rigging, and safely distribute the rig loads to the hull and adjacent ring frames. The parts were expertly prefabricated and assembled in the shop by Eric Goetz and his world-renown team at Goetz Custom Boats. Goetz sent personnel to Nassau to install the new components, and perform the repair/ reinforcement work described above. The interiors of the yachts were air-conditioned to remove excess humidity, and ensure the high quality of the lamination work during the Bahamian summer. All tabbing and reinforcements were vacuum-bagged. At the conclusion of the project, Burke Design inspected the completed work in Nassau on behalf of the insurance company, and SailNassau was back in business again! 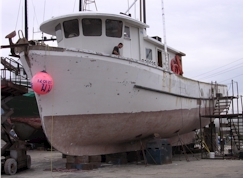 When the twenty-five year old 68-foot fiberglass commercial fishing vessel Blue Sea was hauled for repairs and upgrades in the spring of 2006, thousands of osmotic blisters were discovered, covering virtually her entire hull below the waterline. Her new owner called Burke Design to evaluate the problem and prescribe a remedy. 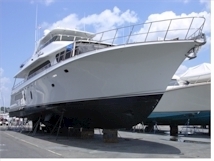 We wrote a comprehensive repair procedure with specific product recommendations, covering removal of the gelcoat and damaged laminate, complete drying of the hull below the waterline, repair of the laminate at the deeper blister locations, application of an epoxy barrier coat, and application of antifouling bottom paint. Careful adherence to the procedure ensured that the Blue Sea will remain blister-free for many years to come. 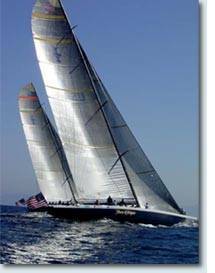 Atlantic Mutual Insurance Company, the insurer for Team Dennis Conner (TDC) in the 2002/2003 America's Cup campaign, asked Burke Design to investigate costs associated with the repair of the International America's Cup Class (IACC) yacht USA-77, Stars & Stripes. The boat was damaged during an accidental sinking while training off Long Beach, CA in the summer of 2002. The sinking occurred in relatively shallow water, allowing the boat to be salvaged. Unfortunately, damage was extensive enough that the entire bow and foredeck, forward of the chainplates, as well as the cockpit support beams, needed to be replaced. Schedule demands required that the damaged USA-77 be shipped directly to New Zealand, site of the America's Cup challenger series, while the replacement parts were being fabricated. 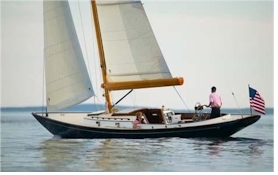 The yacht's original builder, New England Boatworks (NEB) of Portsmouth, RI, was selected to build the replacement bow section and cockpit beams. When the parts arrived in New Zealand, the damaged sections were removed from the boat, and the replacement parts were joined to the existing structure. Burke Design prepared a detailed cost analysis of the repair for the insurance company. Data provided from NEB computer records and interviews helped Burke Design to create a spreadsheet totaling weekly invoices for the repair, including labor hours and costs (at multiple rates), material costs, travel expenses, and subcontractor costs. The total repair labor hours and costs were then compared with similar figures from the original construction of TDC's two racing yachts, USA-66 and USA-77. This comparison allowed an accurate determination of whether the cost of repairs was indeed "fair and reasonable", based on the ratio of surface areas between the repairs and the boat's entire structure. The repair investigation report compiled by Burke Design enabled Atlantic Mutual to quickly reach an equitable settlement with all of the parties involved. Composites One is the nationï¿½s largest composite materials distribution company. When one of their customers, Atlantic Boat Company of Brooklin, ME, was having trouble with a particular resin system, they called Burke Design to investigate and resolve the issue. The hull of the BHM 39 commercial lobster boat, Miss Britt, was built with a unique resin system designed to improve the cosmetics of the finished part. However, problems with secondary bonding adhering to the hull were evident from the outset. This condition was severe enough that the owner would not return to sea in the vessel until the situation was resolved, leaving the yard liable to pay for his lost fishing time. Burke Design traveled to the yard on short notice. Inspection of the vessel revealed significant areas of delamination of (secondarily bonded) tabbing to the hull. Components affected included the main bulkhead, work deck, hull longitudinal stiffeners, and interior components tabbing. Gelcoat was also noted to be peeling from the hull in large areas. Further examination identified that the hull surface beneath the failed tabbing was glossy in appearance. Company labor records were checked, and showed that experienced laminating personnel had performed all of the original work. Attention was then turned to performing on-site tests on a variety of specially prepared secondary bonds. This was done in order to verify the viability of further repairs, prior to the establishment of a repair procedure. Five separate tests were performed and witnessed during the yard visit. These tests were designed and agreed to in advance, enabling all preparatory work to be accomplished prior to our arrival at the yard. With test results in hand, it was determined that, for this particular resin, surface preparation needed to be much more aggressive than is customarily required for secondary bonding. A repair procedure for the delaminated and adjacent tabbing was prepared by Burke Design on the spot; a formal copy was issued to the yard the following day. This enabled Atlantic Boat to begin the repair immediately, minimizing yard costs and returning Miss Britt to service in record time. Following an excellent result in the 2003 Round Gotland Race, Scandinavia's most prestigious regatta, the J/145 Sofia later suffered damage to her hull and keel in an unfortunate grounding incident. Her owner, seeking to ensure the strongest, lightest, most reliable repair possible, contacted J/Boats, Inc. headquarters for advice in obtaining the finest possible technical assistance. He was referred directly to Burke Design. 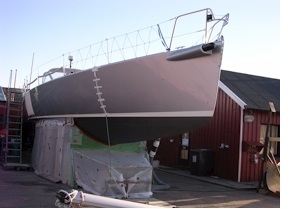 Burke Design was immediately brought into communication with Raa Boatyard in Sweden, the designated repair facility. Detailed information and digital photographs were exchanged, so that we were able to specify the appropriate preparatory work that would be needed prior to the start of the actual repair. We also forwarded a complete list of the materials required to effect the anticipated repair, in order to speed their procurement. Once the preparatory work had been completed, Burke Design traveled to Sweden to inspect the damage to the yacht. We worked closely with the boatyard staff and their consultant, Johan Berggren of Marin Custom, who was brought in to assist with vacuum-bagging the repairs to the damaged carbon fiber/E-glass hull skins. This was necessary in order to ensure that the lightweight skins of the racing yacht would fully adhere to the underlying core material, and achieve their required strengths. Upon our return to the office, Burke Design issued a Damage Inspection and Repair Procedure to the boatyard and the owner. The report thoroughly documented the damage to the yachtï¿½s hull, structural grid and keel, and provided a very detailed, step-by-step procedure for their repair. We stayed in close communication with all of the involved parties while the structural repair work was being carried out. Progress was monitored through the continuous exchange of digital photographs. At the conclusion of the work, all were in agreement that the quality of the repair was excellent. As such, Sofia should continue to serve her owners well for many years to come. Dodson Boatyard of Stonington, CT asked Burke Design to specify and oversee the repair of Lyric, a 35-foot sailboat damaged in a severe grounding incident in 2001. Inspection of the boat showed extensive damage to the keel, as well as to the hull bottom. Hull structural damage extended from forward of the mast step aft to the companionway, and included the keel floors (transverse hull stiffeners). As the boat was less than a year old and was raced competitively, the owner was concerned that the repairs not add additional unnecessary weight to the vessel. To ensure that the repair would be as structurally efficient as possible, Burke Design obtained the J/105 hull laminate schedule from the manufacturer. The repair procedure was subsequently designed to adhere as closely as possible to the original build specifications. We issued a detailed work procedure for the repair of the boat, including the removal of all damaged material, repair of the hull laminate, installation of new keel floors, retabbing of the main bulkhead, and reinstallation of the head unit, interior joinery, mast step and keel. Burke Design visited the yard several times during the repair process, inspecting the work to ensure that high quality standards were maintained throughout. Following each visit, progress reports were sent to the yard, the owner, and the insurance company. Dodson Boatyard of Stonington, CT contacted Burke Design on separate occasions during the winter of 2001/2002, for assistance with rudder and hull repairs to Hinckley 59 hull #1, Cetacea. The yard was in the process of doing a major off-season refit of the vessel for her new owner. Inspection of Cetacea's rudder revealed evidence of several prior repairs. 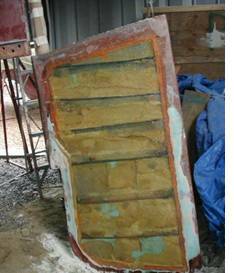 It was learned that this particular rudder had a history of leaking and structural problems, and that the rudder design had been changed by the builder for later yachts of her type. The stainless steel rudder post and internal ribs were found to be in good condition, and the decision was made to fully restore the watertight and structural integrity of the rudder blade. Burke Design prepared a work procedure, which included several drawings, for a complete structural rebuild of the blade. The procedure called for the fabrication of new fiberglass chordwise and spanwise internal ribs (fastened to the existing stainless ribs where applicable), installation of new internal closed-cell urethane foam, and lamination of new rudder skins (see photo of rudder restoration in progress). Dodson yard personnel, some months later, found what they described to be an unknown "putty-like" material, located in the interior of the hull laminate on the port side of the yacht. The material was found during the routine inspection and replacement of thru-hull fittings, and was not noted to be present on the starboard side. Questions about the nature of this material, and concern about the fact that some minor delamination had occurred, prompted the yard to call Burke Design to investigate. In addition to the removed thru-hulls, upon our arrival small V-shaped grooves were cut in two additional places into the port side hull laminate. This was done in order to determine the extent of coverage of the material in question. These exploratory cuts were made in such a way as to minimize the time and effort required to effect their later repair. The "putty-like" material was also found in the grooves, and was therefore assumed to be located throughout the port side of the hull. Two small core samples were then drilled through the hull laminate, and sent to an independent test laboratory for analysis. The lab analysis revealed that the material in question was a vinylester-based putty. Further investigation into the history of the boat uncovered the fact that Cetacea had run aground some years earlier, causing significant damage to the port side of the hull. Subsequent water intrusion into the laminate resulted in 90% of the port side core material and outer skin having to be replaced in an earlier repair. The mystery of the "putty-like" material, and its origin, had been solved! Burke Design carefully examined the laboratory analysis results, and calculated that the port side hull repair laminate exceeded American Bureau of Shipping (ABS) structural requirements, for outer skin fabric weight for this size of vessel, by approximately 20%. The vinylester putty used in the earlier repair was noted in our report to leave the boat subject to potential increased localized hull damage from any possible future impacts. However, due to the excellent bonding characteristics and resistance to water absorption inherent in the vinylester material, the recommendation was made that no additional special repairs were required for the port side of Cetacea's hull. This recommendation saved the owner many thousands of dollars in additional repair costs. Our final report included a repair procedure for the hull laminate in way of the exploratory test grooves and core samples. Brewer Yacht Yard at Cowesset, Warwick, RI, called Burke Design for engineering help with repairs to an Irwin Citation 40-foot sailboat. Queequeg suffered the loss of her mast and rigging when the structural failure of the chainplate support bulkheads caused the chainplates to pull right up through the deck. Burke Design first diagnosed the cause of the problem, finding that the failure was due to water ingress at the locations of the chainplates' penetrations through the deck. The moisture had gradually deteriorated the original plywood support bulkheads, to the point where the rigging loads eventually tore the chainplate bolts right through the bulkheads. The water ingress was also found to have damaged the structural integrity of the deck in the surrounding area. We prepared a comprehensive repair procedure for the yard, calling for the removal of the existing chainplate support bulkheads and adjacent interior joinery; repair of the damaged deck laminate including local replacement of the core with high density urethane foam material; thorough surface preparation of the hull inside skin and underside of the deck; fabrication and installation of new chainplate support bulkheads, constructed of heavy fiberglass skins with high density urethane foam cores; and reinstallation of the chainplates and interior joinery. Supporting calculations also revealed the need to increase the size of the chainplate bolts from 3/8" diameter to 5/8" diameter, in order to safely accommodate the rig loads. Queequeg was then fitted with a new mast and rigging. The completed repair not only restored the structural integrity of the vesselï¿½s chainplate support system, but also insured that any potential adverse effects from water ingress will be much less likely to occur in the future. This repair is one of a number of successful collaborations between Burke Design and the Brewer yard.